As a young engineer I used to sometimes ponder on the long torturous career (ladder) path one could follow in ‘the firm’ – no matter whether you were an electrician, technician or engineer. I worked for a huge company (De Beers) mining and selling gem diamonds with billions of dollars of revenue and which had been around for over a 100 years. A hugely wealthy company with generous conditions and a magnificent emphasis on training and education and other upliftment activities in their communities. The debate was always to move from being in a purely technical role to that with more management but the last thing on our minds was that this huge company with tens of thousands of employees would diminish to a shadow of itself. Which is what came to pass as the diamond mines were gradually sold off. A story replicated thousands of times around the world with other industrial and engineering firms. Where is the Greasy Pole of Career Upwards Progression Today? The metaphors vary – from ‘climbing the ladder’, ‘breaking the glass ceiling’ to ‘shimmying up the greasy pole’. All of them have the idea of steady upwards progression if you play ball and do the right thing by the firm. However, this is not the case today as companies are in a constant state of flux – remember the days of ‘re-engineering’ a decade or two ago – this has simply accelerated? Even companies that were boring and predictable have been cast to the wolves. For example, the power companies (often government owned) sold a predictable thing – energy and they have suddenly woken up to huge competition from their consumers with PV solar panels proliferating meaning less power consumed from the utility. And some companies have plunged into the abyss. What is worse is that the jobs we aspire to often have changed dramatically or have been outsourced because of some new corporate model. So the ‘job for life’ – as you no doubt repeatedly hear about – is not always part of our careers any more. Naturally, two of the most important things is working on something you enjoy – hopefully using your strengths - and at the same time building up financial reserves for you and your family. 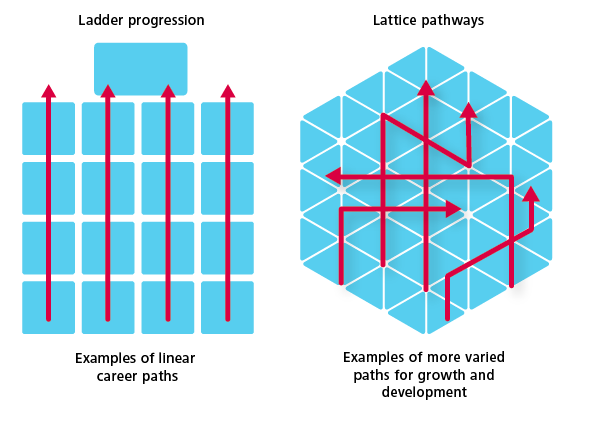 But this doesn’t mean that your career has to follow the traditional ladder of progression but can follow other more interesting paths. You don’t always necessarily continually move upwards in your career but may take some side ways moves. Similar to moving sideways on a lattice framework. For example, you may set up a business (the ubiquitous web site) on the side of your current career. Or work in many different industries in your current career achieving a huge number of widely differing skills. Perhaps experimenting with areas that you may enjoy and can develop further in the future. There is a huge opportunity for reskilling and gaining new know-how on an ongoing basis – and not necessarily costing much at all. Certainly spending a huge $80,000 on a one year MBA may not be a good idea – there are many other approaches lower risk and considerably more affordable. For example, the free Youtube learning channels are mindblowingly comprehensive and wide ranging. As well as the huge amount of often free resources on the web. A friend of mine who struggled in his engineering career because of the demise of his current company has successfully moved into web marketing with Search Engine Optimisation with a focus on the industrial world. Another has moved from water resource engineering into running a chain of accommodation hubs in a sea side village. A technician told me of his successful foray into supplying and maintaining personalised low cost robots. Another who used to work on oil rigs is using drones to undertake surveillance tasks for a burgeoning list of clients. The list goes on…. Many people in their forties and fifties particularly regard retirement as a termination point when they suddenly stop working. A better strategy, perhaps, is to look at making this more flexible with a mix of work, study and travel or leisure activities. This could perhaps give you more financial freedom and at the same time – keep your brain active and challenged. Tom Freston puts his finger on what a career ladder really is: A career path is rarely a path at all. A more interesting life is usual a more crooked, winding path of missteps, luck and vigorous work. It is almost always a clumsy balance between the things you try to make happen and the things that happen to you.